Solar farms, which supply large amounts of clean energy while consuming less water than traditional power plants, are nonetheless more and more difficult to situate in the United States. Nearby residents complain of the aesthetics and biologists worry that farms located on undeveloped land will endanger delicate ecosystems. But what if solar arrays could be installed in the hundreds of capped landfills throughout the nation? Several states, including Georgia, Massachusetts, New Jersey, Hawaii and Colorado, are doing just that. New Jersey's Brick Township is one of the most recent communities to commence plans for a solar generator at the soon-to-be-capped French's Landfill. The township says it expects to save about $9 million over 15 years. According to township officials, the array will generate revenue in year one and provide free energy to the township after year 15. 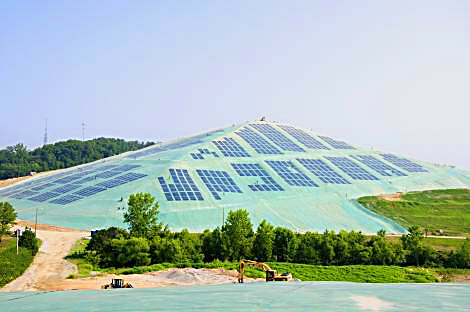 In Georgia, the Hickory Ridge Landfill has already been transformed from a full capacity landfill into a commercial scale, solar energy generating facility. The landfill, developed by Republic Services using $2 million in funding from GEFA as a result of the American Reinvestment and Recovery Act (ARRA) of 2009, will be one of the largest single producers of solar power in Georgia and the state's first landfill solar farm. The site will sell 1 megawatt of power -- enough to power 400 homes -- to Georgia Power. As municipalities continue to buckle under budget strains, solar farms on closed landfills could be a welcome source of income and a bright lining on otherwise unattractive and unused lands. Solar energy cheaper than grid power by 2027?